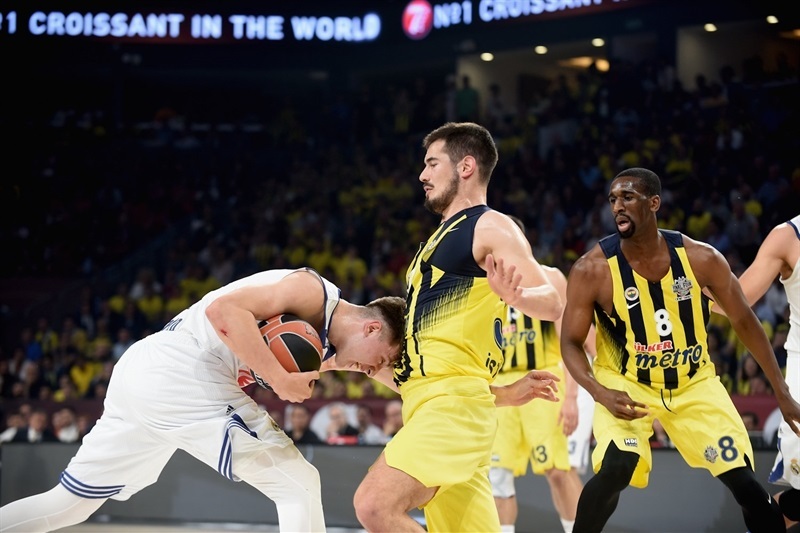 Fenerbahce Istanbul led from start to finish in defeating Real Madrid 84-75 on Friday night at Sinan Erdem Dome in Istanbul and clinching a spot in the Turkish Airlines EuroLeague Championship Game for the second straight season. 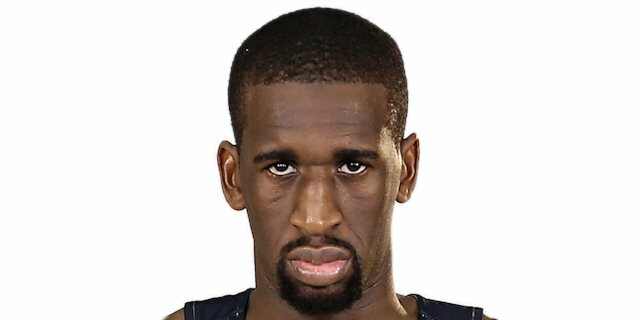 Ekpe Udoh starred with 18 points, 12 rebounds, a career-high 8 assists and 2 blocks to pace the winners. 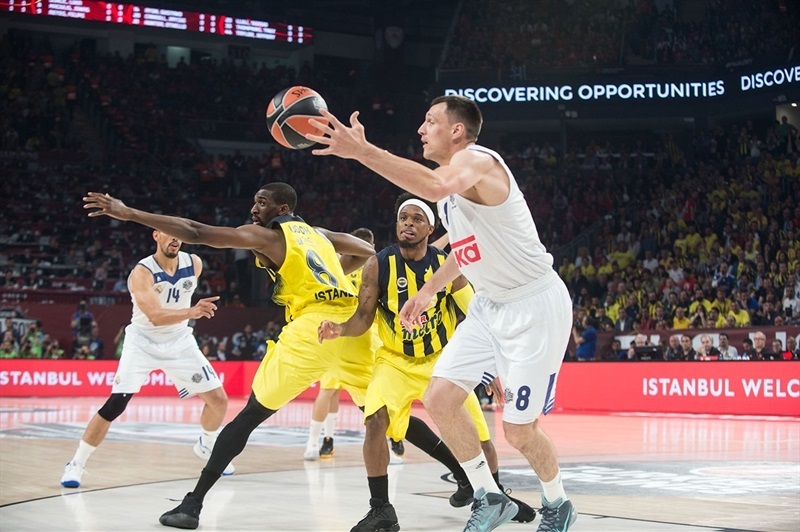 After starting strong and racing out to a double-digit advantage, Fenerbahce remained in control spare a 0-11 Madrid run in the second quarter. 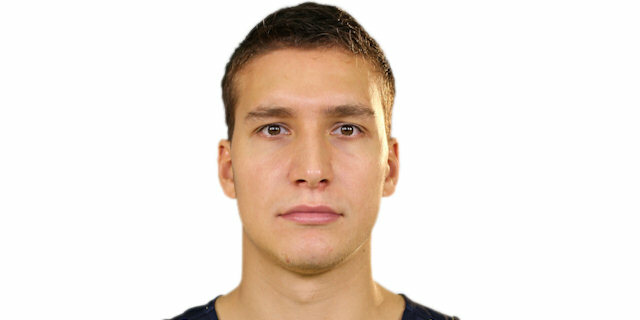 Bogdan Bogdanovic contributed 14 points in the winning effort and Jan Vesely and Nikola Kalinic netted 12 points apiece. Kalinic added 6 rebounds, 6 assists and 4 steals. 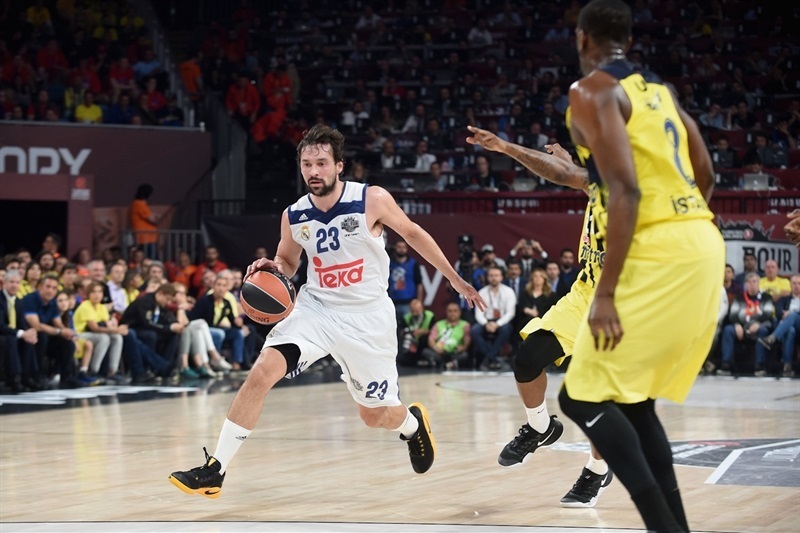 For Madrid, Sergio Llull stood out with 28 points and Jaycee Carroll scored 21. 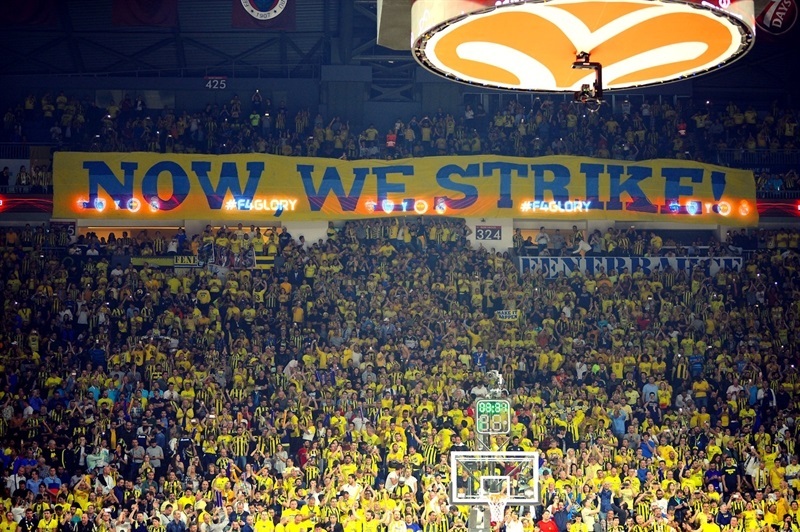 Fenerbahce got better shots and made more of them in what was ultimately the difference. 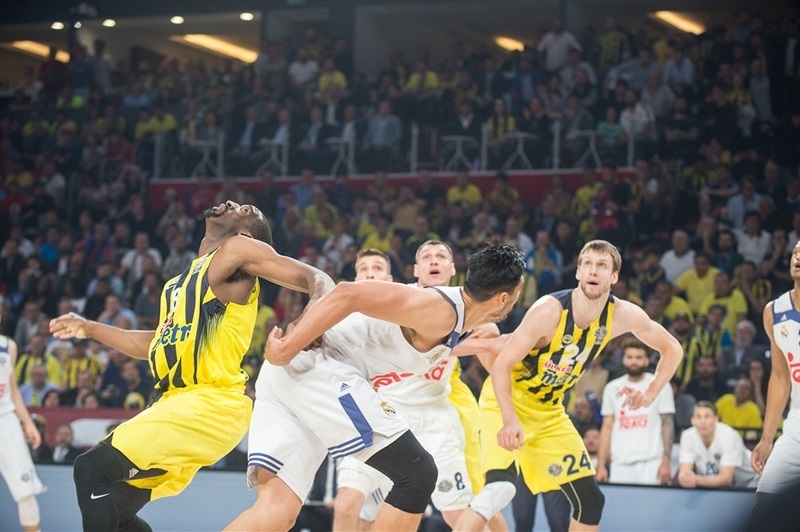 While Fenerbahce shot 22 for 37 (59.4%) on two-point attempts, Madrid was 13 for 31 (41.9%) from the same distance. 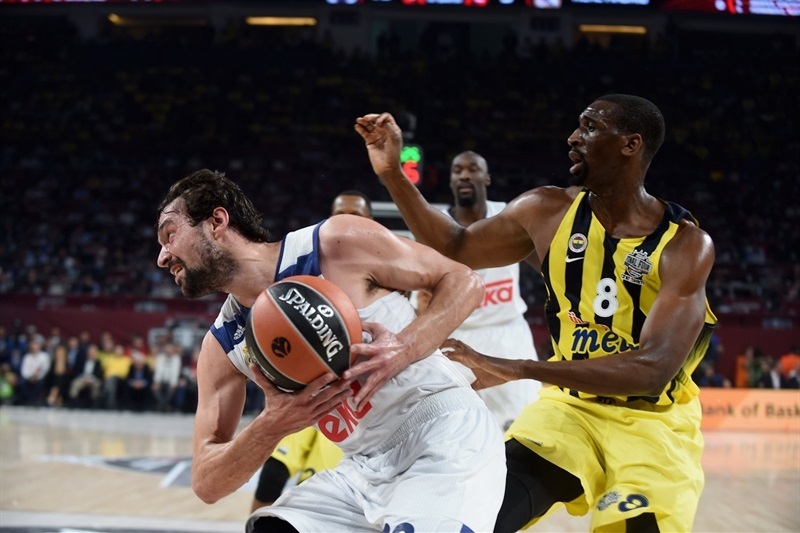 Fenerbahce will try to become the first-ever Turkish team to win the competition when they face Olympiacos Piraeus for the crown. 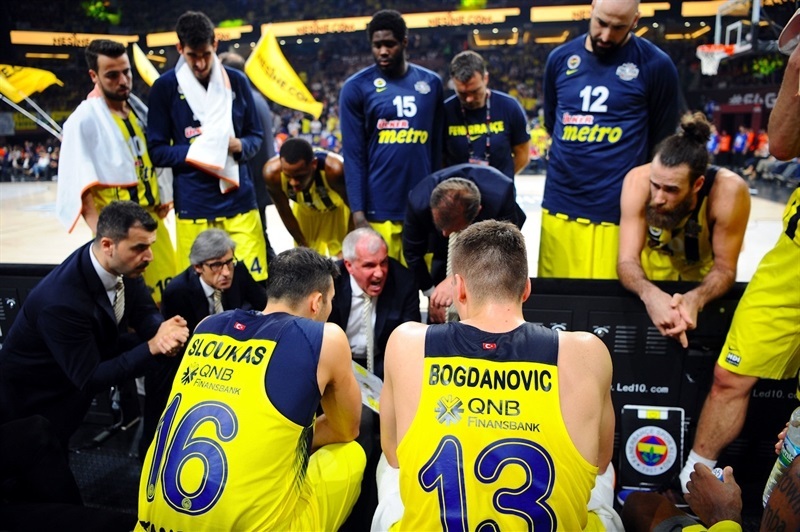 If it wins, Fenerbahce would become the seventh different squad to lift the trophy in the last eight years and coaching legend Zeljko Obradovic would claim his record ninth EuroLeague title with six different teams. Bogdanovic got Fenerbahce going with a stop-and-pop jumper, which Gustavo Ayon matched with a close basket. 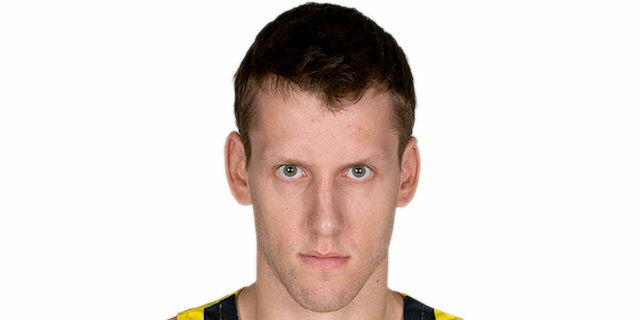 Vesely ignited Fenerbahce fans with a two-handed slam that Kalinic followed with a three-pointer for a 7-2 lead. Vesely took off for yet another slam, but a rainbow jumper by Llull brought Madrd within 9-4. 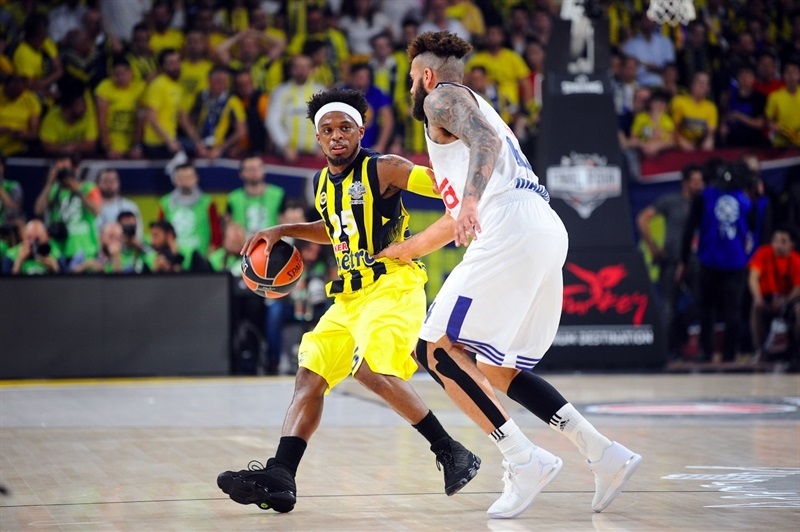 Bobby Dixon joined Llull in the three-point shootout and a layup by Vesely kept Fenerbahce way ahead, 14-7. Dixon insisted from beyond the arc to make it a double-digit game. 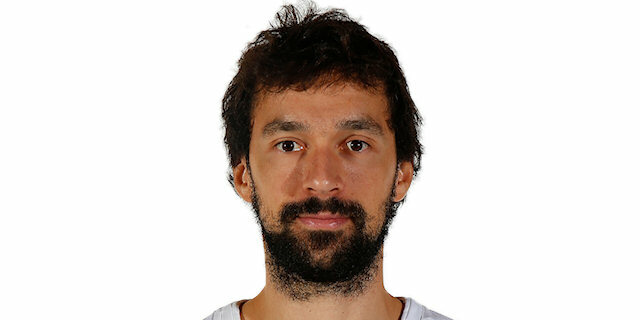 Llull hit free throws – his 2,499th and 2,500th points in the competition, but Ekpe Udoh erased those with a reverse dunk. Madrid tried a more physical frontline with Anthony Randolph and Othello Hunter together on court, and it started to get more defensive stops. Llull kept pushing his team with a mid-range jumper, but Kostas Sloukas quickly answered with a driving layup. A jumper by Llull brought Madrid within 21-13 after 10 minutes. 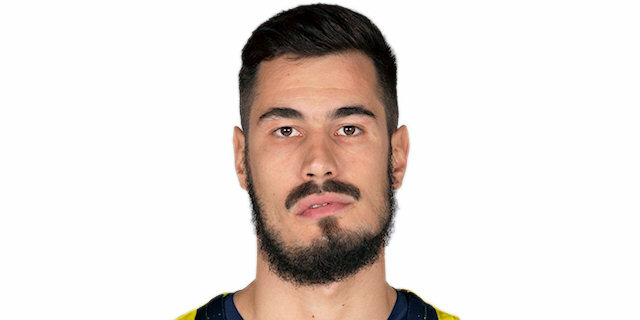 Luigi Datome hit free throws early in the quarter, as Fenerbahce stayed all over the passing lines. 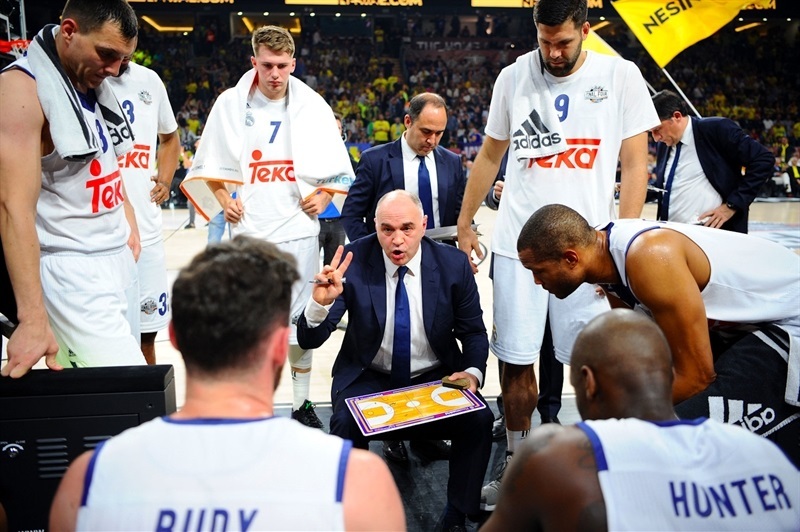 Madrid was held scoreless for more than four minutes and when a wide open three-pointer by Kalinic forced head coach Pablo Laso to call timeout at 26-13. 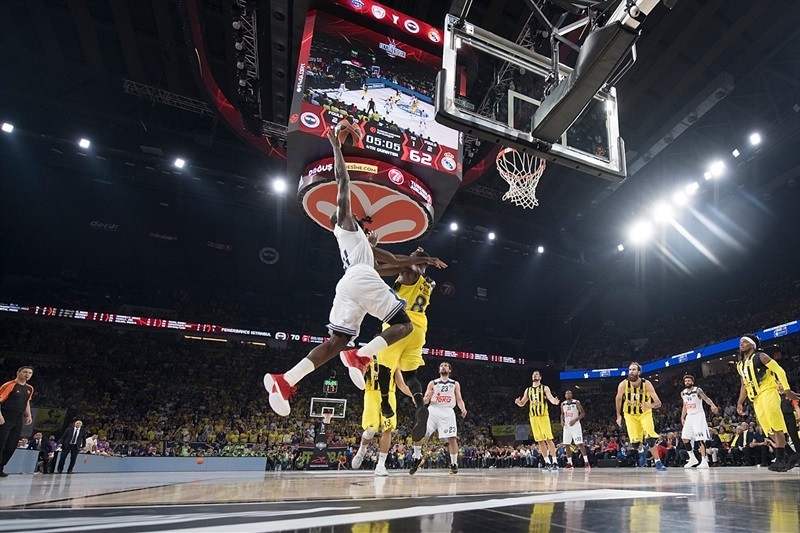 Trey Thompkins stepped up with free throws, igniting a 0-11 run in which he, Llull and Randolph each hit triples to bring Madrid within 26-24. 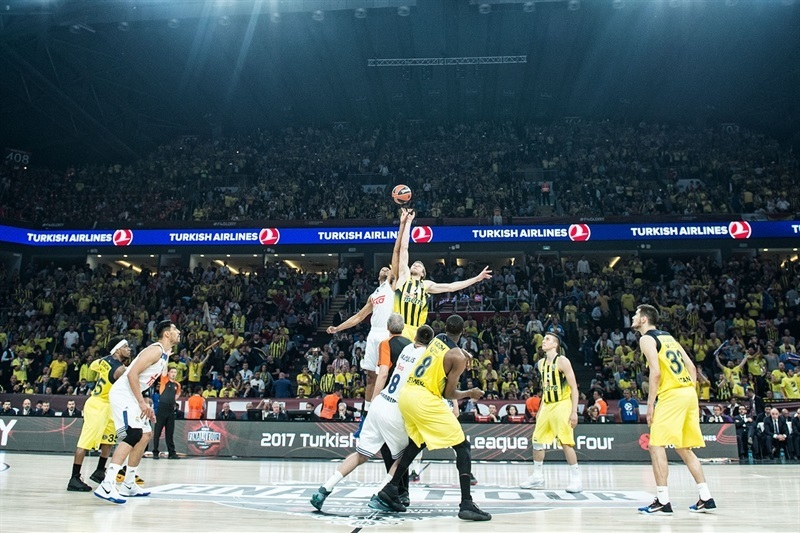 Vesely finished a four-chance Fenerbahce offense with a tip-in and Bogdanovic added a three to boost Fenerbahce's lead to 31-25. An unstoppable Llull scored in transition, but free throws by Dixon and a dunk by Vesely made it 35-27. Randolph left the game due to injury. 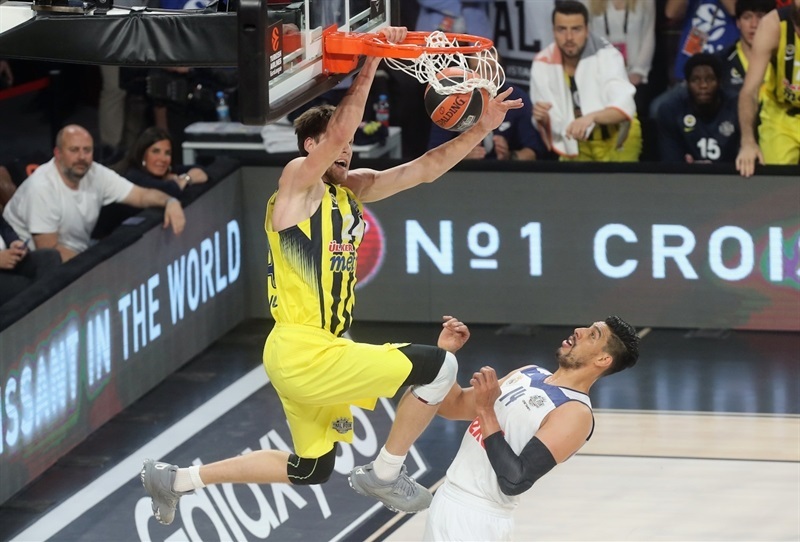 Carroll followed free throws with a three-pointer, but Kalinic sank foul shots and Bogdanovic hit from downtown to restore a double-digit lead, 42-32. Free throws by Llull and a jump hook by Udoh fixed the halftime score at 44-34. Llull split free throws and a recovered Randolph swished a mid-range jumper to give Madrid hope, 44-37, soon after the break. 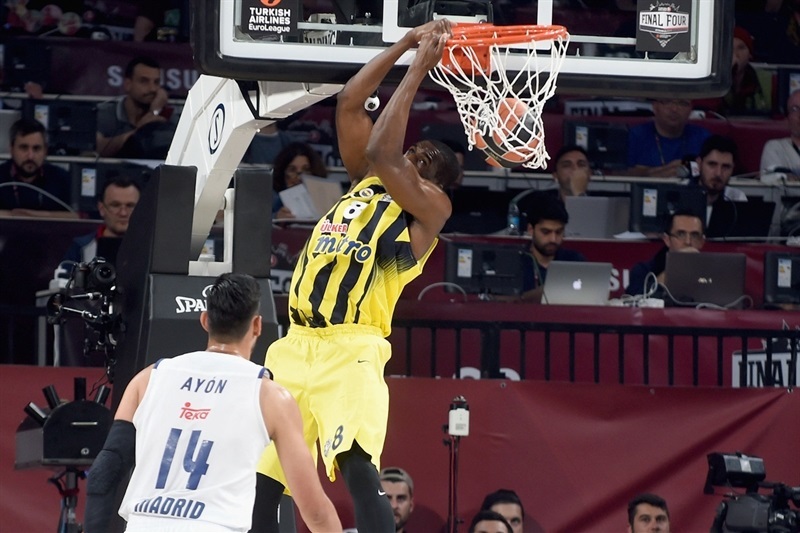 Udoh rescued Fenerbahce with a close basket and Kalinic added an acrobatic layup that restored a double-digit lead. Sloukas buried a stop-and-pop jumper from the top of the key, as Madrid kept struggling to find good shots. Sloukas scored again, but Carroll did better with two of his trademark catch-and-shoot three-pointers, bringing Madrid within 52-43. 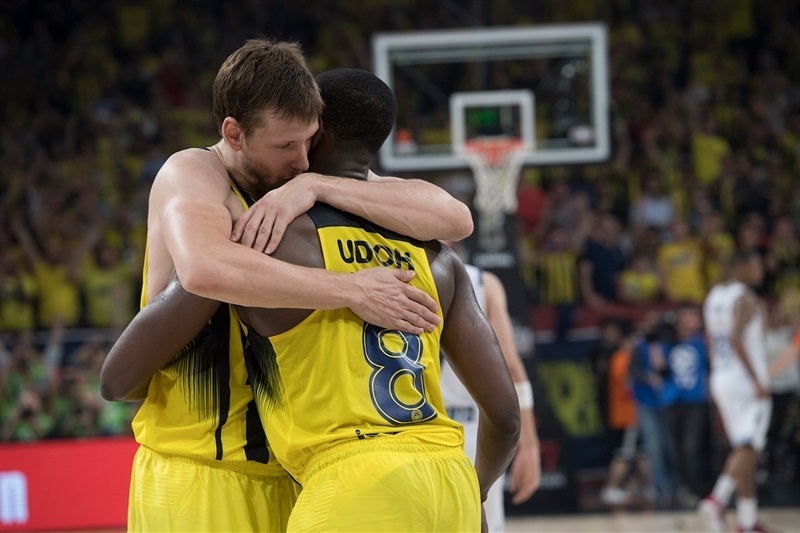 Vesely made free throws and a layup by Udoh kept Fenerbahce out of trouble. Carroll fired in another one from beyond the arc and a driving layup by Llull brought Madrid within 56-48. Udoh stayed hot with a mid-range jumper, which James Nunnally followed with a fast break layup. Another jumper by Udoh made it a 14-point game. Free throws by Sloukas and Llull fixed the score at 63-50 after 30 minutes. 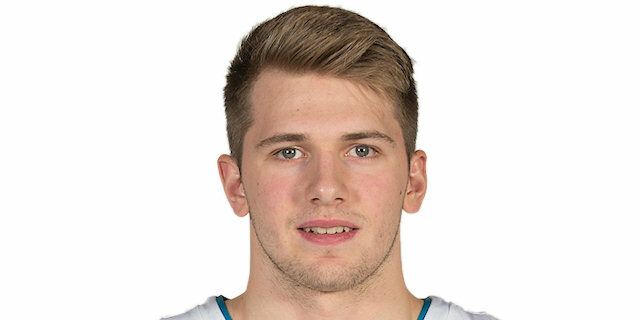 Sloukas and Hunter traded driving baskets early in the quarter and a three-pointer by Datome seemed to break the game open, 68-52, with over eight minutes remaining. Carroll hit a one-handed jumper in the lane and Jeffery Taylor added a corner triple to bring Madrid closer, 68-57. Thompkins sank one from downtown in transition that caused Fenerbahce to call timeout at 68-60 after a 0-8 run. Udoh and Hunter exchanged free throws and a jumper by an unstoppable Udoh made it 72-62 with 4 minutes to go. Hunter took over with a high-flying tip-in that Datome did better with a layup-plus-foul for a 75-64 score. The outcome seemed obvious until Carroll hit a three and Llull a three-point play to narrow the gap to 77-70 inside the final minute. 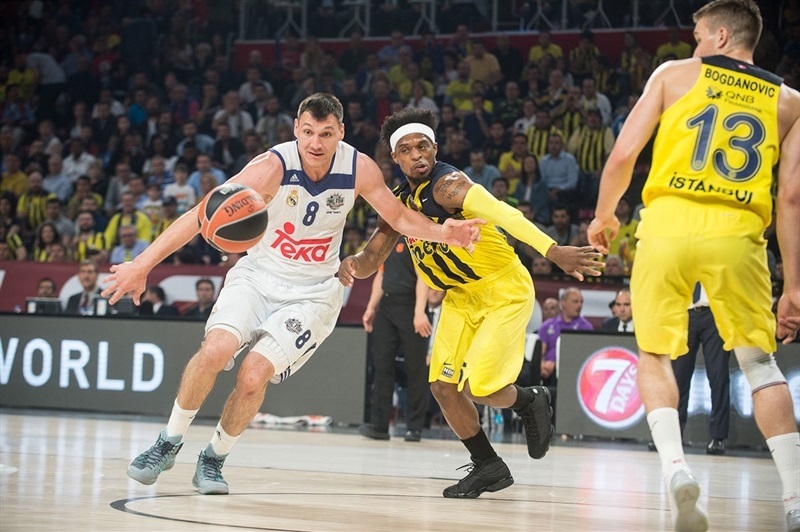 Madrid continued to fight and even got within 6, but the outcome was not seriously threatened as Fenerbahce held on for victory. 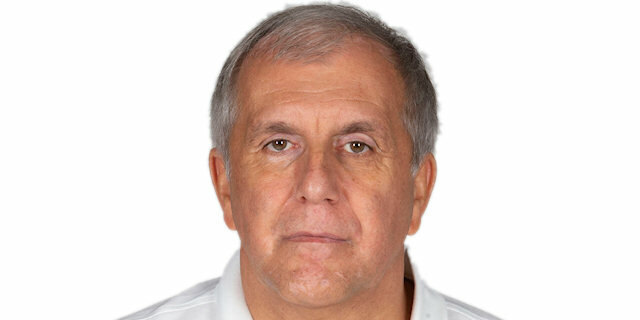 "We played tonight against a team that dominated the regular part of the EuroLeague. We were ready for a very tough and physical game. And I am very happy about how we played a full 40 minutes. 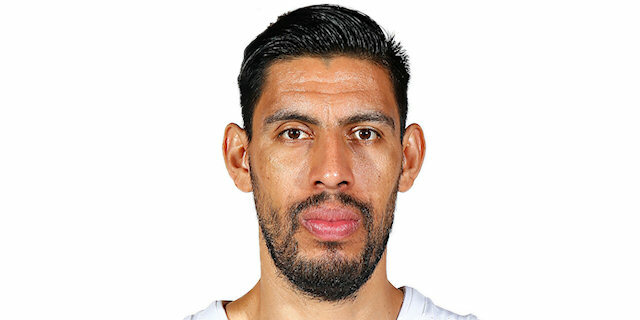 Sergio played an incredible game offensively and did a great job one-on-one. We played 40 minutes of good basketball. Congratulations to our players and also to the great support like it’s been the whole season. [Udoh] played an excellent game. To see some statistics like that in European basketball is not easy. He can play a lot of ways and can pass. But who the opponents try to stop plays a role. They tried to stop our creative players, and he had space to pass. And he can play like that. It’s impossible to play a perfect game, but tonight I believe that we played a very good game." "Not much to say. When you are able to arrive at this level, you know you have to play a good game of basketball to win. We didn’t do that, and we lost. We always felt like we were behind Fenerbahce. We tried, but it was not the day. Sometimes basketball is so complicated. 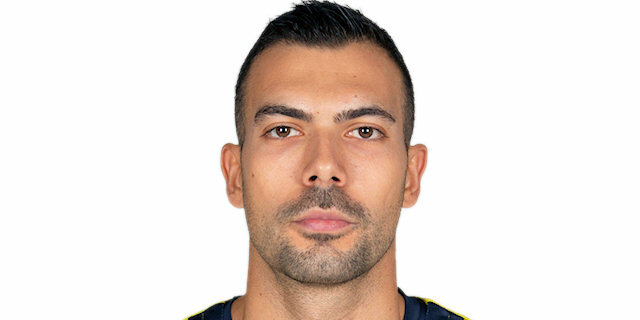 Fenerbahce played a good game and won and they deserve it. I think Sergio played with a lot of heart the whole game like he always does. But we are a team that needs everybody involved. Sergio played with determination. I am more worried about how the team played." "It was very important. We showed character. We have been having good momentum the last few weeks, and we knew if we played good and controlled the rhythm we had big chances. Llull and Carroll scored because of their amazing talent, but as a team we played amazing defense, controlled the rhythm, we did not let them score easy baskets. I feel blessed, it is my fifth Final Four and fifth final for me. I am lucky and blessed. More talented players than me did not achieve such success." "We played with a lot of confidence, but more importantly, we played as a team and that took us to the championship game. And I want to thank the fans, they helped us a lot. We controlled the game, pulled away right, first to 6 points, then to double digits. They did come back a little, but we pulled away for good again and did not let them threaten again. But I still think we should be better in that segment, we should not have allowed them to have a chance for a comeback after we were up by 14 or 16 points." "I don’t know if this is the best game I played, but it is one of the best. I really like to do a bunch of things on the floor. I like to put my fingers into everything. Sometimes it turns out bad, but it turned out good tonight. Thankfully, we played great and won. I think we proved we are a tremendous team when we all play together, and if rwe epeat this, we could be seeing a happy end on Sunday"
"I know I was close to a triple-double. I am grateful for that, but it does not matter. I can have zeroes across the board as long as we win. I mean, I also played 38 minutes, coach trusted me so I was able to make things happen. It is part of our story, that we struggled early in the season, but now we are 40 minutes away from the title." "We knew that at the Final Four it is about focus, and about how you play from the first to the last second. And that’s what we did today. We had our ups and downs, but we stuck with our tactics and knew what we want to do. Even when they hit those three consecutive triples and tried to come back, we played our game and that was the key. I love these kinds of atmosphere, and I am very happy the Final Fours is in our fans’ city so they can enjoy it." "We are disappointed because we played a bad game, even a very bad one. Sergi (Llull) and Jaycee (Carroll) played a good game but the rest did not do well and we are disappointed. It was a hard game but we should not have gone out this way. It is my Final four but I hope it is not the last one. I would like to play more Final Fours, of course." "Things didn't work out. We played a bad game and we lost. We did not play well, personally I had a very bad game and I am sad and disappointed at that. The team at some points played well, but we just could not make it. I had lots of faith in this Final Four, but it just didn't work. I even feel guilty." "When you lose a game like this it's hard. We didn't meet the standard we had to meet to play a game like this, especially against such a hard team as Fenerbahce, who punishes your mistakes. They played better, they deserved to win and now we have to think about the Spanish League. I always try to play at my best level, but I also made mistakes. When we win, we all win, and when we lose, we all lose. We knew it would be hard, but we leave with a heavy heart because I think that if we had played at our level we could have won this game."